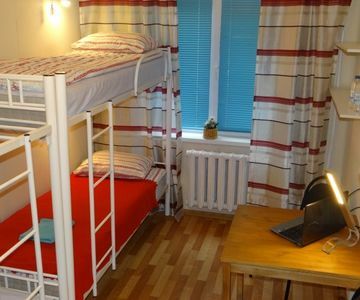 Individual room in a mini-hotel in Stavropol. Double room +1 extra. Place, without any sub-populations. In the room: internet, new furniture, comfortable bed, orthopedic mattresses, lockers, clean bed linen and towels. Kitchen area and sanzuly for three rooms: electric stove, all utensils for cooking and eating, iron, ironing board, washing machine, high-speed Internet WI-FI. Next to us is a delicious bakery - every morning fresh pastries and a cup of fragrant coffee. Very clean, fresh and cozy. To smoke strictly on the street! The Kuban State University, Southern Management University, Kuban State Technological University, the State Traffic Police Department of the Ministry of Internal Affairs, the Bulgaria cinema, as well as the City Hospital No. 3, the Clinical Oncology Dispensary No. 1, the Sunny Island Park are within walking distance. Nearby are the shopping and entertainment centers of SBS Megamoll, Auchan, Leroy-Merlin, Baucenter, Galaxy, Media Plaza, Eastern Market. As well as supermarkets Tabris, Magnit, shops, lounges, cafes, banks, etc. An endless number of minibuses that go along the Stavropol. The mini-hotel is located on a large traffic junction, tram, trolley, minibus - stop nearby, at any end of the city to reach quickly. Direct shortest routes to the auto- and railway stations, to the airport on the city and private cars.